Love Authentique Papers and Unity Stamps? that combine both of these beautiful companies into one! went with tons of colorful ribbons and stamped tags on the handle instead. After measuring the height of the body, I cut two strips of "Joyful" paper into 5x12". glue in attaching my papers to the tins. To hide the seams, I glued on some ric-rac. wanting the cute shape to really stand out, I decided to trim it from the background. Now, what to do with my FESTIVE tin? It's time now to head over to my fellow Authentique gal, Heather's Blog! given away during the course of this two-day blog hop...good luck! This is just so beautiful and so Christmasy!! Love the touch of ric-rack!! LOVE this Shellye...sooooo pretty...love the red stitching. Oooo, very pretty!! And a super idea to store those items under your tree!! beautiful project - love that xmas paper. This is so beautiful! It would be fantastic for holding Christmas cards! WOW!! This is so beautiful and practical too! I am thinking you should make many more and fill them with cookies for the teachers and your friends! The ric rac to hide the seams is so smart! I love it!! The Christmas tin is beautiful! How you're going to use it is a great idea! Christmas paper immediately reminded me of my grandmother. Love it! WOW!!!! I just LOVE this project!!! What an amazing work of art!!! Here's what I particularly like about this project: The papers you chose are very elegant. I like the added touches on the tags. I really, really like the idea of having such a cute storage space for things you might need that you can keep under the tree! LOVE this! 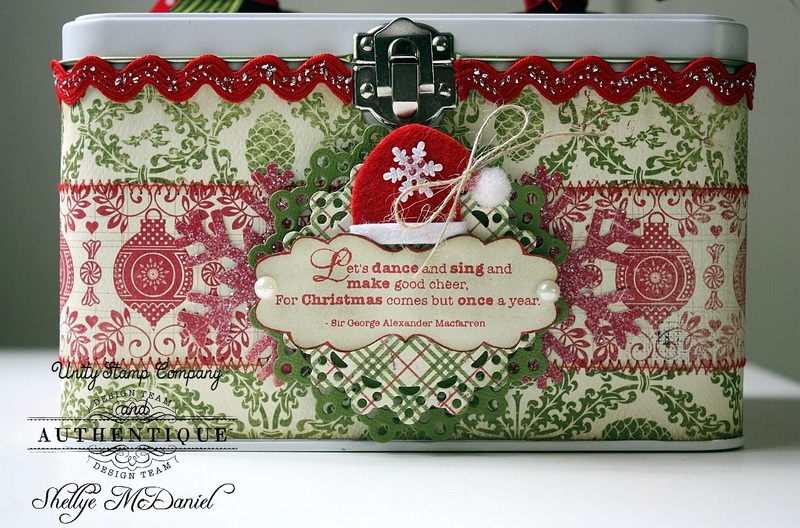 The festive line is just that, perfect Christmas colors, love all the ribbons and the stamps! idea for the things to put in the tin. Very pretty tin. I am sure it will be very useful. Shellye that is beautiful,love the warm colours and the stamps! It seems like every stop has an amazing project and yours is simply elegant. Thanks for sharing your idea with us. This is so pretty, love these stamps and papers! Shellye this is amazing!! Such detail and beautiful colors!! New to your blog. 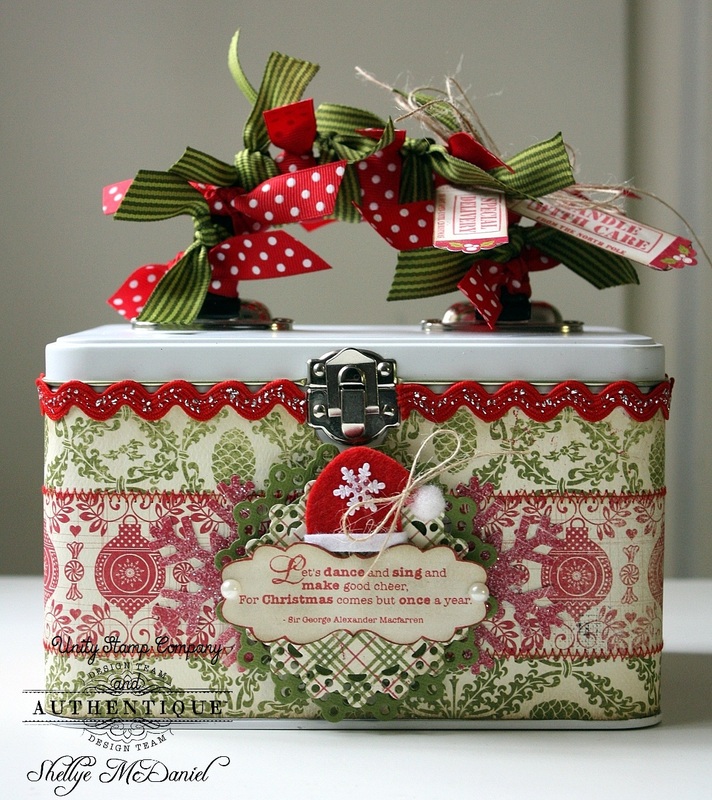 LOVE your festive tin! What a great idea to store the things you always need to use at Christmas time. Thanks for the chance to win free stuff to feed my papercraft addiction! wow you box is so pretty. this is my favitore project. so, far for today I love the paper. This is a really beautiful way to use the stamps and papers. I love your idea of storing the odds and ends for the tree in it and putting it under the tree. Another really great project! What a great idea for storing all those little needed items you can't get your hands on when you need them. Love it! What a gorgeous box! I love that collection of papers :) I have the Naughty or Nice stamps-really cute set! Your know what I would so with this adorable tin. If I had a Christmas Party I would use it as my little clutch purse. It would be talk of the party. How lovely is this project??!!! And that sentiment is so inspirational! Lovely combination of patterns and collors Shelley! Lovely project!! I love the little santa hat!! That would make a great gift filled with something nice. It is too good to give away though. Super cute lunch pail!! Love the paper! My favorite Authentique paper! Tins are soooo much fun. So festive--I like all the ribbons on the handle. 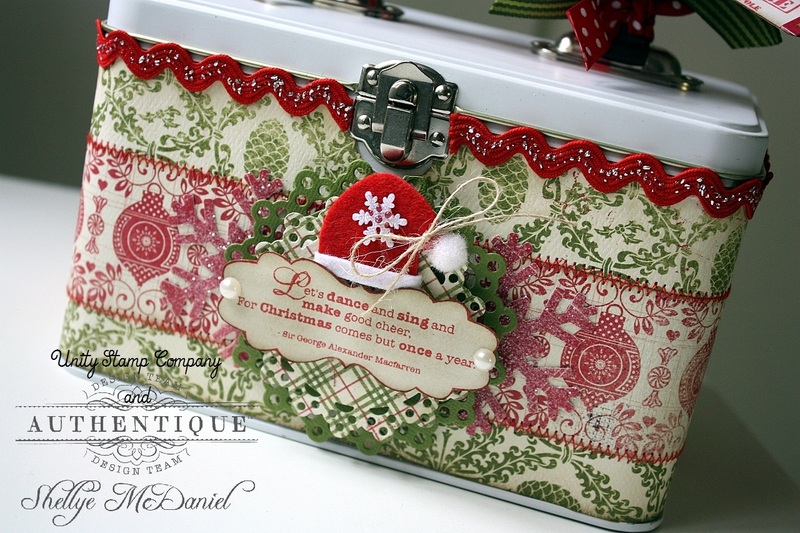 I am loving this, so creative Shellye, this would look amazing filled with your Christmas cards! This is such an adorable project! You did such an amazing job on this! 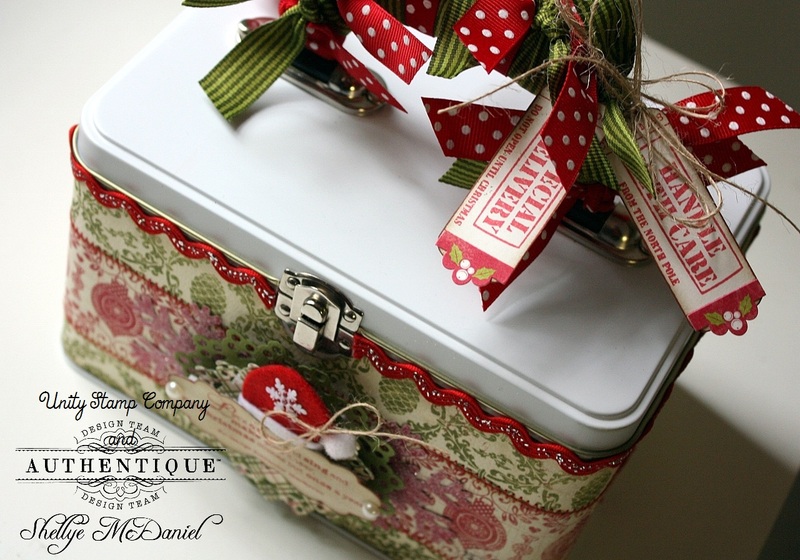 such a pretty box for a terrific idea! OMG, I'm so jealous! I've been trying to put some time aside to make a lunchbox project. You did an amazing job with Authentique's fun papers! This is so pretty! I love this! Your projects are always so clean and elegantly done! Well, I can't seem to get the above comment "OMG, I'm so...." to show that Sandy J from FlockPaperGlitter posted. I guess, I've been out smarted by this blog. But it's still a cool project. Thanks! Gorgeous Christmas Project!! Have some of that paper in my hands already! What a great idea for containing all those little items needed around the holidays. And pretty enough to sit out in plain site. Gorgeous ! Love that sparkly red rick rack. Fun project, love the design! 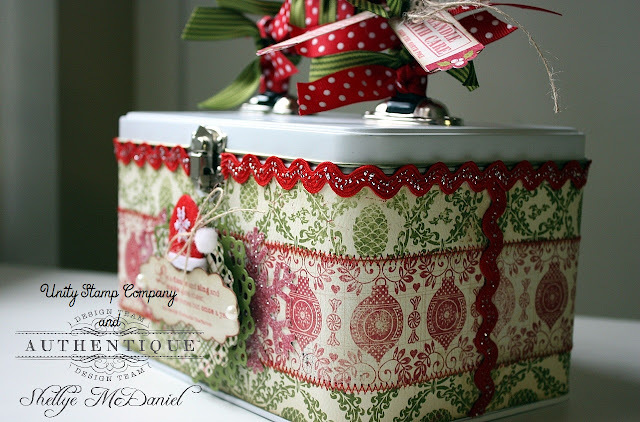 With authentic's fabulous paper and those wonderful stamps, it makes altering a tin so wonderfully easy. Love the touch of holly leaves on the stamped tickets. So cute. Me, I'd use the lunch boxes for small candy gift boxes. That's just the right size for a small thank you gift, etc. Thanks for the fabulous idea. Sweet and festive indeed! I love the doilies! Oh, wow. that is super cute. i love the papers on here and the ric rac. It is such a gorgeous holiday project! The ribbons give it a very festive feel. Cute box! I love how colorful it is! Simply beautiful! LOVE the papers and the tied ribbons on the handle! What a pretty Christmas tin!! A great idea to fill with goodies as a gift!